There are at least 4 Alpine Institute Guides in this video, Andrew Yasso, Paul Rosser, Tom Kirby, and Ben Gardner. Who do you know? Everybody was psyched for the day. On February 19th I finished a month on the road and returned to the Pacific Northwest, finally ending my journey just after midnight. Contrary to expectations as I drove over Snoqualmie Pass, fueled by loud music and gas station coffee, the weather was not grey and misty. Instead I was greeted by clearing skis, a half moon, and what appeared to be awesome snow conditions. I pulled over and proceeded to bother every Northwest ski partner I could think of. Finally my friend Boe up in Bellingham gave me the desired response and I made the extra hour and a half drive up I-5. After a couple hours of sleep and more caffeine we got to the backcountry lot at Mt. Baker Ski Area. Conditions were better than expected. Conditions were perfect. Clear skis, cool temps, and good snow. We started skinning out of the parking lot around 9am with the goal of heading out towards the Coleman Pinnacle, which is a high point along Ptarmigan Ridge. After what seemed like a quick and easy skin we transitioned below Table mountain. 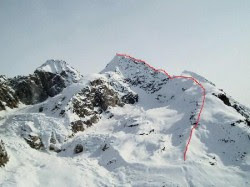 Our planned route took us under the south face of Table and we were glad to be crossing this slope early in the day. 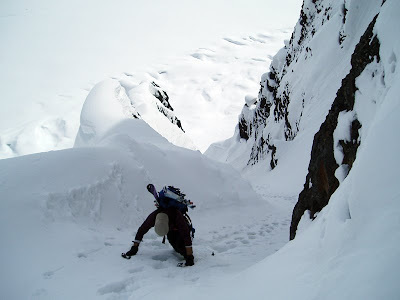 ﻿﻿﻿We continued to traverse out towards the Coleman Pinnacle with great snow conditions. Snow on north aspects had faceted throughout the night creating some pretty good skiing conditions. In order to take advantage of these conditions we decided to sneak in an extra run on the way to the Pinnacle. While my legs did not thank me at the end of the day, it was worth it. After some of the better skiing I have had in a while, we put skins on, enjoyed some lunch, and continued on towards the Pinnacle. ﻿ Eventually our objective was in sight. Getting to the top was steeper than expected and we were forced to work on our bootpacking skills. Notice Boe's upside down ski pole handle anchor technique. Skinning off the top of the Pinnacle has been something I've wanted to do for a while and conditions were great. 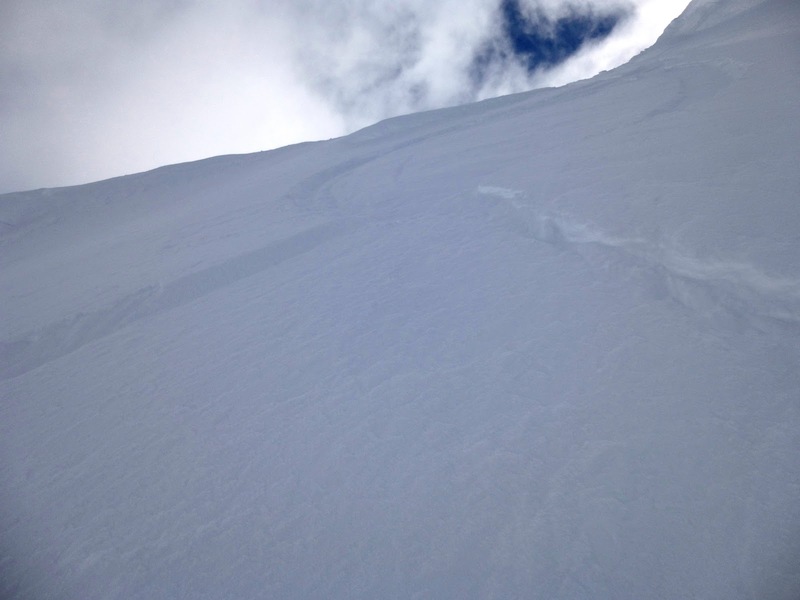 After some steeper rolls on the upper ridge we were able to drop into the north slope we skinned/booted up. Boe riding the upper ridge. Lower down on the slope that we booted up we had a concern about wind loading. We were able to ski cut a small roll which produced a small wind slab. Ski cutting is a rather advanced technique, make sure you have the proper instruction before attempting it in the field. 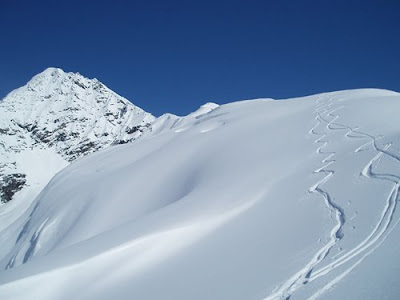 After some more stellar skiing we began the long haul to the Herman Saddle. Due to dwindling energy and battery power my propensity to shoot photos declined but Boe was able to motivate and take some stellar shots of the sunset. The ski from Herman Saddle to the car was pretty brutal. The sun had its way with much of the slope and except for a couple hidden stashes of decent snow, it was a bone jarring ice fest back to the car. Overall it was a great first day back in the northwest. Canyoneering tricks are often extremely applicable to rock and alpine climbing. The little trick featured in this video could easily be used by a party setting up a toprope on a sketchy edge or -- as in the video -- by a party rigging a rappel on a weird lip. This technique is most applicable with a larger group that needs a fixed line. With a small group, the first climber could just belay the second climber down to him after building the anchor. The crux of this trick is played out in the video very quickly. Watch closely at the 1:50 second mark. I'm not sure I'm that excited about the ratty sling and the quicklink shown in the video. It is really important to make sure that your anchor is completely solid. Belayer belays climber out to edge. Climber at edge builds an anchor and fixes the line. The climber at the top converts the line by running it through the quicklink and clipping a carabiner to a clove-hitch on the backside. This could also be done by running the rope around a tree or a boulder. If you do it through a tree or a boulder, be sure that there isn't too much friction and that the line could still be retrieved. Once the line is fixed on both ends, a climber could clip in with a sling to a carabiner to descend or the climber could put a friction hitch on the rope. A friction hitch would provide a higher level of security. Only one person should move on the fixed line at once. The last person will bring down the backside of the fixed line, the end that is not running through the quicklink. Once the rope is released from the anchor, it will be able to be easily pulled down. The folks at Salomon have done it again, with another great episode of their Freeski TV. With an overwhelming number of forest fires in the summer of 2012, those slopes have now become wide-open playgrounds for skiers this winter. This video highlights not only some great skiing, but the tragedy of the burns and eventual triumphant return of the forest. We've all heard the analogy of a calm, smooth lake looking like a sheet of glass, right? Well how about actually snowboarding on a sheet of glass - literally! This next video from the folks at networkA and Signal Snowboards comes from their Every Third Thursday series, where they come up with crazy new prototypes for snowboards - some that work, and some that don't. The fun is in coming up with the idea and trying to execute it. With this episode, the crew travels to Italy to build a glass snowboard and in the end they get some surprising results. Two weeks ago, Mt. Baker Ski Area hosted it's 28th Annual Legendary Banked Slalom, the longest running snowboard competition in the US. This event draws some of the biggest names in the snowboarding world, with both industry legends and rising stars converging at this event. This next clip gives you all a glimpse of this amazing event. Legendary Mt. Baker Banked Slalom 2013 from Snowboarder Magazine on Vimeo. Mt. Baker is getting dumped on this week, with close to a foot and a half estimated for Friday morning - just that morning! Let's hope a Weekend Warrior gets out there and grabs some amazing footage! So Part 1 showed how to make ice anchors with two screws. Part 2 will show you how to make ice anchors in more complicated scenarios. Let's get to it. Sometimes you want an extra screw for security. It could be because the ice itself is not that strong and you want another anchor point to add to the mix. It could also be that you only have shorter screws, which can sometimes leave you wanting another piece. The process itself is quite similar to a 2-screw anchor. Place three screws in the ice, ideally about one foot away from the others. it is best to offset the screws a bit on both vertical and horizontal planes. Clip a carabiner to each screw, and clip in your anchor material. A triple-length sling or cordalette works really well with 3-screw anchors. To make this anchor, do a V-thread (see a following blog for how to make V-threads) and put in a screw. Again, make the screw up and to one side of the V-thread. Clip a carabiner to each piece. Clip in your anchor material (shown is a 48" runner). Tie your figure-8 knot to create a masterpoint and clip in your master locker. Voila! A similar setup can be used to backup a V-thread for rappels. Stay tuned to the blog for more info about how to do this. --Mike Pond, instructor and guide. There are loads of different types of anchors, but they all use the same fundamental strategy: connect multiple, sound points of protection together to use their combined strength and redundancy to make a unified anchor. In this series, we'll look at different anchors you can make on ice. In Part 1 (the current entry) we'll do a basic 2-screw anchor. Part 2 will deal with other types of ice anchors. I took these pictures during a recent course in Ouray, Colorado, where we practice making different types of anchors on ice. Note that these are all on water ice, not glacier ice. The two are different at times in character, but we use the same principals for anchors. Step 1: Find a safe location with bomber ice. Ice climbers send down some shrapnel! Make sure that you're out of the way to avoid getting hit. This usually means going to the side of an ice flow or hunkering down under an overhang. Step 2: Find good quality ice for anchor. Good ice is not fractured, hollow, or aerated, and is attached to whatever it's on (usually rock). It's a little difficult to describe exactly, but this part is fairly intuitive. Step 3: Place the first screw. Locate a place that the ice is fairly flat. If there are any protruding points of ice, feel free to use the adze or pick of your ice tool to knock them out to make the surface smooth. You'll want about a 10-inch diameter to allow the ice screw to rotate completely around. The angle of the screw should be roughly perpendicular to the surface of the ice. If anything, have it go just slightly (less than 10-degrees) downward. Drive the screw on home! Step 4: Place the second screw. Locate a place at least one foot away from the first screw, ideally up and to the side. Rumor has it that ice fractures along it's horizontal and vertical axes, so if you put the screw in up and to one side it should avoid that potential problem. (I have never even seen an ice screw fracture ice, let alone break it, so I cannot fortunately, say from personal experience on this one). Step 5: Clip a carabiner to each ice screw. I usually use wire-gate non-locking biners. Step 6: Clip your anchor material to each biner. You can use a double-length (48") sling, which seems to be the perfect length for ice anchors. You can, of course, use a cordelette, or triple-length sling as well. Step 7: Tie your figure-8 knot to create a master-point. Step 8: Attach your lockers, and belay on! See Part 2 to see ways to make ice anchors on more complex terrain. This winter I've been pushing myself a bit at the rock gym. With that in mind, this winter I felt that I needed to get into better rock shape before heading down to Vegas for a long stint of guiding in the spring. I've been wearing an absolutely spectacular all around shoe for both my long days out on the rock as well as for my gym sessions. I've had a pair of Five Ten Newtons for the last couple years and have really enjoyed them. 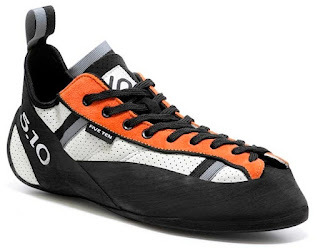 Honestly, I'm not much of a gym climber, so this shoe might not be the best choice for your standard gym session. Instead, the shoe was designed for long multi-pitch lines and crack climbs, the types of things I do the most. The Newton is very stiff, perhaps one of the stiffest shoes that Five Ten offers. It has a supportive midsole, and a very cushy feel from the lined uppers and the padded tongue. I've worn the shoe on dozens of multi-pitch lines in places like Red Rock Canyon, Squamish, Leavenworth and on alpine routes in the North Cascades. In every instance the shoe performed extremely well. With that in mind, there is a tendency to look at harder multi-pitch lines and to want a shoe that has the tight fit of a sport or bouldering shoe; but to then look at the number of pitches and the length of the day and to think that there's no way that you'd want a tight shoe. One of the nicest things about the Newton is that it has a cool lacing system, which Five Ten refers to as the S-Lacing Closure. This system allows you to crank down the shoe for the harder pitches with smaller holds, while still providing the ability to losen it up for easier terrain. Many climbing shop employees are under the impression that you should buy climbing shoes that are two sizes too small for your feet. The thing to remember about climbing shop employees is that most them are boulderers and bouldering requires super tight shoes. I am absolutely not a fan of painfully tight shoes. However, there is some legitimacy to somewhat tight shoes. Historically, I have bought my shoes one full size smaller than my street shoe size. Most climbing shoes tend to stretch out to a point where they end up being about a half-size smaller than my street shoe. I find this somewhat comfortable in a climbing shoe. However, when I bought the Newtons one full size too small, I couldn't get my foot in. I had to return them for a shoe that was half-a-size smaller than my street shoe, and these were still a bit tight, though they stretched out to a comfortable size rather quickly. I have noticed that Five Ten shoes are a bit on the tight size, so be wary about ordering them online without trying them on first. Especially if you're looking to buy right before a road trip and don't have time to send them back for a larger pair. One other important thing to note about the Newtons is that the soles are covered in Stealth Onyxx rubber, as opposed to C4. The Onyxx rubber has a higher level of durability and is supposed to be stickier. I didn't notice much of a difference as far as how sticky the shoe was under normal conditions. However, I found them to be much stickier when it was warm out. As far as durability goes, the rubber appears to be far more durable than C4. I had the shoes for over two years before I had to resole them. With most shoes it seems like I need a resole once a year. I need some good shoes to get after some of the long adventure lines in the desert! The American Alpine Institute will be a primary sponsor of the 9th Annual Red Rock Rendezvous in Red Rock Canyon just outside of Las Vegas. This will be the seventh time that our guides will be involved, teaching clinics and partying alongside everyone else at the event. This year our guides will be running multi-pitch climbing trips throughout the event and beginner climbing days on the 30th. They will also be teaching a variety of programs on the proceeding days. Every year the event just gets better and I have to say that last year's was the most fun so far. Here is a blog with a number of photos and videos from the 2012 Red Rock Rendezvous. Major climbing athletes make their way out to the Mojave Desert for the Rendezvous every year. Big names at the event include the likes of Beth Rodden, Peter Croft, Katie Brown, and Andreas Marin. But some of our best guides will also be on hand. These include people like Mike Powers, Kurt Hicks, Richard Riquelme, Alasdair Turner, Ian McEleney, Paul Rosser, Ben Traxler, Mike Pond, Chad Cochran, Andrew Yasso, Erin Smart, Dustin Byrne, Ben Gardner, Tad McCrea, Doug Foust, Quino Gonzalez, James Pierson, Mark Cionek and Jeremy Wilson. In addition to all of the courses going on around Red Rock Rendezvous, don't forget that AAI will have all of our best guides available for private guiding and instruction in Red Rock Canyon. To learn more, send us an email at info@alpineinstitute.com or give us a call at 360-671-1505. This first clip is of Aleksandra Taistra's ascent of Cosi Fan Tutte 8c+, 55 m long classic of Rodellar! Ola Taistra on Cosi Fan Tutte 8c+ from Jason on Vimeo. Eric Pollard smoothly combines deep powder lines with big air tricks in this next segment. The last video for this weekend is a little longer, but well worth it. It is called "Tempting Fear: Inside the mind of Extreme Skier Andreas Fransson" This combination of POV footage, recreated scenes, and narrated journal entries gives an great insight to the mind behind numerous first descents, but which has also endured physical pain and mental hardships. Salomon Freeski TV S6 E07 - Tempting Fear from Salomon Freeski on Vimeo. In the previous Tour Planning and Navigation blog, we outlined the gear necessary for planning and executing your outdoor adventures. Here we will talk a little bit about specifically what to put into your tour plan at home. This is the first step in planning route objectives. Weather, avalanche observations, route conditions, local beta, your maps, etc. are all important factors in your planning process for multi-day or single-day excursions. There are many resources for this step in your planning, the largest being internet resources, guidebooks, topo maps etc. Photos of the area are great too if you can find them. When using an internet resource or book make sure that your information comes from a reliable source, as there are often many incorrect assumptions made, especially on internet forums. Whatever your resource, make sure to use a notebook (Write in the Rain type) to write down what you need or print it out as you will forget the details in the field. I will sometimes even laminate route beta in pocket size to pull out for quick reference on route. Lastly, it can sometimes be helpful to have a small map photocopy of your planned objective, along with the large hard-copy of your map. One for quick field use, and the other large hard copy for more detailed planning along the way if needed. This insures that your maps don’t get thrashed during the day. In this step you should plan the route using your maps and the other information you have collected. 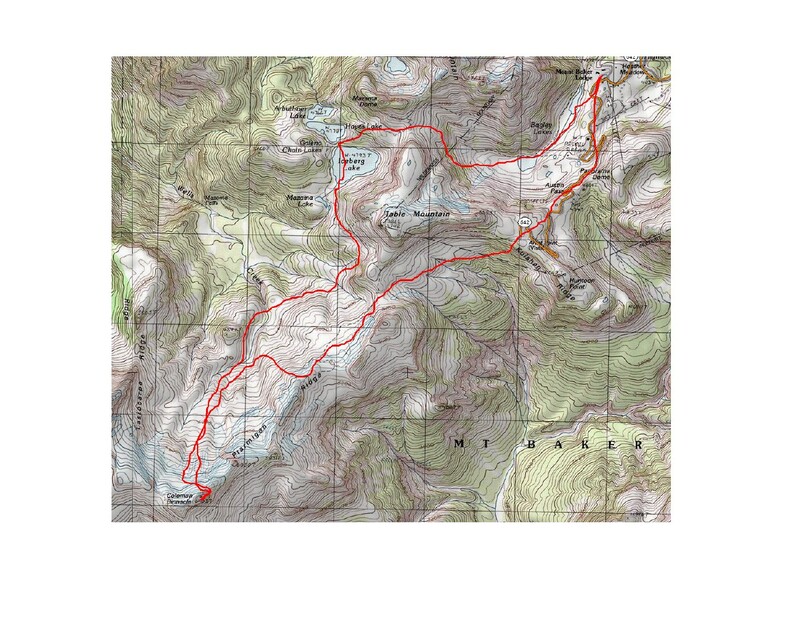 Divide the route up into different legs, such as from one known landmark to another. For example, one rock outcropping to another at a certain given elevation on your map. Make sure that the legs of your route do not span too much distance as this makes for a larger margin of error when navigating in limited visibility. Mark these legs lightly on your map with a pencil and label them to make them identifiable when recorded in your notebook. If using GPS this is the time to also pull the waypoints off your map using a UTM grid tool or a computer program. This step also takes into account the given conditions for the day. This piece sounds somewhat formal but can be as easy as a conversation with some note taking. The day of your departure have a chat about the planned objectives with your partner. Identify the hazards you may encounter along the way, both natural and human created. Record them in your field notebook. Is this objective still obtainable given the parties experience and the conditions? Also, collect the weather forecast (avalanche forecast if appropriate) for the proposed time period and file it in your book. Make sure you go through some type of gear check along with this part of the plan to be prepared in case of emergency. This includes emergency phone numbers to SAR teams and for your family in the event of an injury. 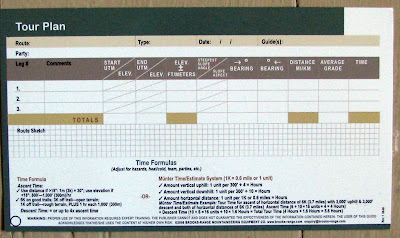 Establish a concrete plan for a turn around time if daylight is an issue, based on the calculations you have made in your tour plan above. Be willing and flexible to change your plans, and have other options available to you. A well planned tour. Untouched skiing! The rewards for a well planned ski tour! 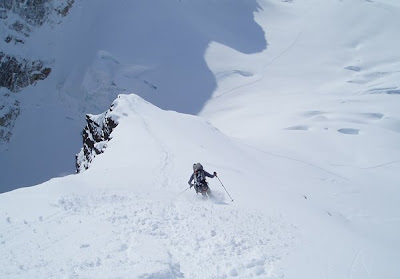 Planning a backcountry ski or climbing trip encompasses a wide range of details that can ultimately define the safety and success of any adventure into the wild. In the field climbers make countless difficult decisions dealing with route options and safety. Why not be prepared for them with a bomb-proof Tour Plan? Here we will detail the materials needed to get you started. Details, Details. A USGS 7.5 minute series map is the preferred scale for domestic trips. The basic sighting compass with adjustable declination, slope meter, sight, mirror, and rulers. 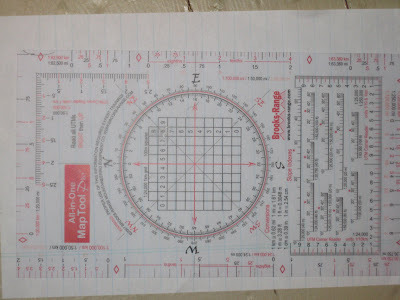 The basic materials for any trip are a good map and compass. Without the ability to interpret them both, route finding would be pretty tricky eh? We want to have as detailed up to date maps as possible so that major route options and hazards can be easily identified before the trip and found along the way. The United States Geological Survey (USGS) produces multiple series maps covering a vast majority of the United States and parts of other countries. Typically domestic outdoor recreationist use the USGS 7.5 minute scale topographic series maps which offer excellent detail. If traveling in other countries similar map series can be found, some of which will offer even more accurate detail than the maps found in the US, and others well….good luck. 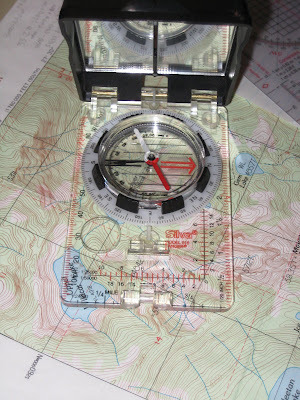 A sighting compass is also one of our most valuable tools in the mountains. Like selecting a new car, make sure your compass has all the options, but not so many that you will get confused with it. A basic sighting compass with mirror, and adjustable declination arrow will make your orienteering efforts much more accurate especially when triangulating (resection) on unknown locations. Other options that make things plush are a built in slope meter, distance rulers (printed on the base plate), and a magnifier (which I use to ID snow crystals). Prices range from a few bucks to hundreds of dollars, in my experience don’t spend hundreds but get something a little higher end than the one from your 8yr olds outdoor detective kit. You want something with a few more options. Brooks Range Map Tool. Sweet! In the digital age we can use a few more items to make our planning and route finding more efficient. Knowledge and use of basic GPS units, an altimeter, and a map/utm grid tools will help you create pinpoint accurate plans in little time. 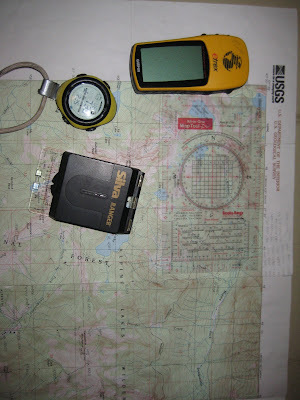 A GPS unit can make planning, in conjunction with a computer, super easy. Getting acquainted with these sytems can take time but will create a plan quickly and can be printed out at home custom, with a multitude of different mapping programs. When selecting the right program for yourself realize that they all have there limitations, and one user may prefer one over another, most systems create the same product so it is important to ask around and see what other users recommend with the ever changing technology. Personally I use a basic Garmin GPS unit, in conjunction with the National Geographic TOPO program. This seems to work really well for all of the western US and Alaska. Disclaimer: A GPS is not a replacement for good map reading and compass work! Get really good with your maps. Now find yourself a Brooks Range (www.brooks-range.com) All –in- One map tool for easy UTM grid reading, and distances on varying scales of maps. This tool incorporates just about all the information you need to formulate an accurate tour plan on almost any type map. Now… put all of this information into a nice weather proof journal. I use the Write in the rain #311 (www.RiteintheRain.com) type book for all planning, forecasting, and snow science reports. That’s a lot of information! Guess what? You will be super excited to have it when making difficult decisions with your friends! AAI Guide Tad McCrea recently sent us some great footage from an amazing climbing trip in Patagonia this winter. This first video is of Tad and his climbing partner, Beau Carillo, on Aguja Guillaumet. impresionante! from tad mccrea on Vimeo. After a successful summit of Guillaumet, the duo set their sights on the Whillans Ramp route on Aguja Poincenot, which turned out to be "the raddest alpine adventure either of us had ever attempted." wind makes me stronger from tad mccrea on Vimeo. Congratulations to Tad and Beau! Tad is currently in Ouray, CO, teaching our Beginner and Intermediate ice climbing courses for us, but will also be guiding Denali this spring and in the Cascades this summer. If you'd like to set up a trip with Tad, be sure to call us at 360-671-1505 or 1-800-424-2249. North Cascades National Park has a New Superintendent! Karen Taylor-Goodrich has been selected as the new superintendent of North Cascades National Park Service Complex in Washington. Taylor-Goodrich has been the superintendent at Sequoia and Kings Canyon National Parks in California for the last three years and will transition to her new duties at North Cascades in March. She replaces the former superintendent at North Cascades, Chip Jenkins, who left the park last year to become the deputy regional director for Pacific West Region in Seattle. 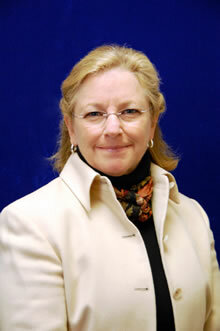 Taylor-Goodrich previously served as the associate director for visitor and resource protection in the Washington Office and has more than 30 years of experience directing a wide variety of operational programs at Yosemite, Grand Canyon, Lake Roosevelt, Cumberland Island, and National Capital Parks-East. Her extensive international work experience includes advancing protected area management projects in Tanzania, sister park agreements in Cambodia and China, a trans-boundary wilderness management agreement among Mexico, Canada and the United States, and international government manager forums for several World Wilderness Congress agendas. Taylor-Goodrich received a bachelor of science degree in geography from Portland State University in Portland, Oregon, with additional graduate work in natural resources management. 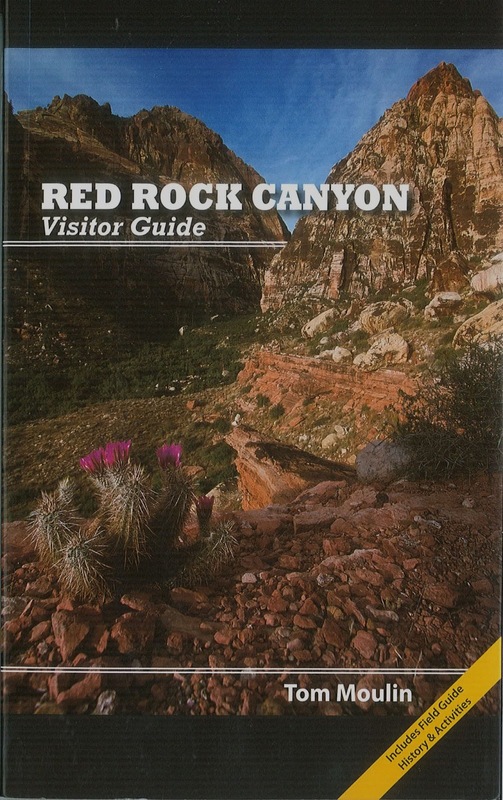 The Red Rock Canyon Visitor Guide by Tom Moulin is a resource not to be overlooked if you are visiting Red Rock Canyon. It took me a few years of climbing to learn that I shouldn’t show up at a crag without a decent guidebook if I wanted a decent shot at a good experience. For many crags that is all you should need, some route beta and maybe some brief insights about the geology, history or sensitive land-use issues. Red Rock Canyon on the other hand is a different story, climber or not. Red Rock Canyon is a federally managed conservation area because of its unique sandstone bluffs and fragile ecosytem. Red Rock’s unique landforms just happen to provide world class climbing, however, the climbing is but a fraction of what Red Rock has to offer. 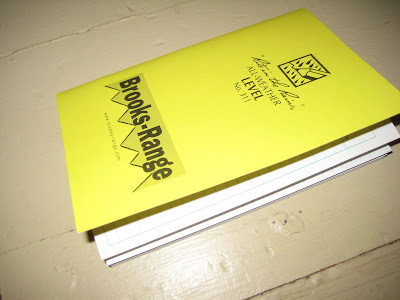 Moulin’s only has two pages dedicated to climbing but it is filled with valuable information for any visitor and should be considered essential equipment while in the Canyon. Moulin leaves no stone un-turned in his exploration of the Canyon. From addressing little things like the common debate over to the various nick-names, Red Rock vs. Red Rocks, or Sandstone Bluffs, through the history, the biology, the botany and the geology of the area. Moulin’s exploration of the geology of the canyon leads nicely into the Native American history which is in part represented in the Pictograph’s and Petroglyph’s found on the walls of the canyons. Moulin covers European history next and the history of movie making in the canyon last. Geology and history are just the beginning though. A considerable portion of the book is dedicated to the fossils, plants, birds, mammals, reptiles, and insects of the canyon. These sections are well organized and the full color glossy pages of the guide book make these sections particularly valuable. The other feature that is particularly helpful in full color are the maps. The book is wrought with maps of all sorts. 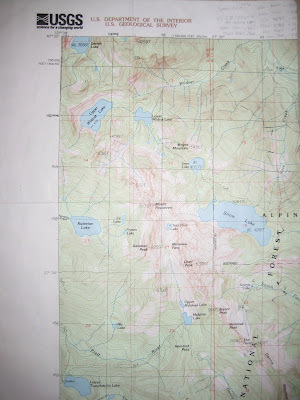 A geologic map, relief maps, a plant communities map, and many hiking maps. 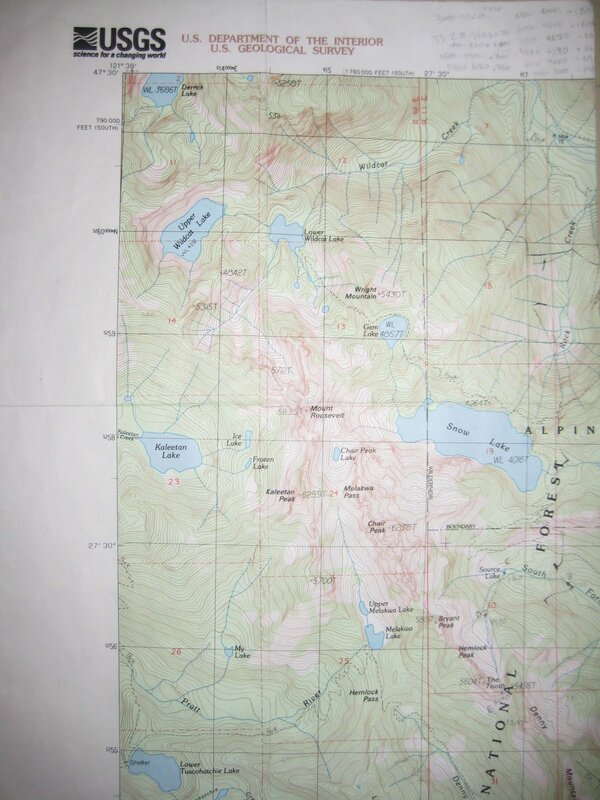 The hiking maps are topographical but are not detailed and do not include elevations. The hike details are conveyed in the descriptions, however, I would not rely on the maps in this guide book for anything more than a quick reference. All in all I think Moulin’s guide book is particularly valuable to climbers and tourists who wish to expand their appreciation for the Conservation Area. After reading this book I can’t wait for my next visit to Red Rock. As a climber I will take a few extra minutes on the way to the crag so I can appreciate some of the other natural wonders of the landscape. As a father I am excited to explore the canyons with my son and search for insects, snakes, and lizards to identify or maybe we’ll see a Bighorn sheep. And my wife will surely want to hike to the waterfall in Icebox canyon. 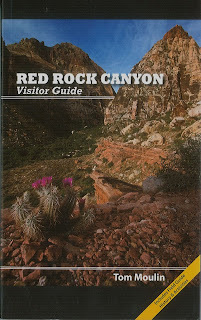 That said, Moulin’s compact yet comprehensive Visitor Guide opened my eyes to the wonders of Red Rock Canyon.